In Lighting Ballast Control LLC, v. Philips Electronics North America Corporation, [2012-1014] (February 21, 2014), the Federal Circuit en banc held that claim construction is a matter of law that is subject to de novo review on appeal, confirming the continued validity of its en banc decision in Cybor Corp. v. FAS Technologies, Inc., 138 F.3d 1448 (Fed. Cir. 1998). In an opinion by Judge Newman, the Court relied upon principles of stare decisis, finding that “[a]fter fifteen years of experience with Cybor, we conclude that the court should retain plenary review of claim construction, thereby providing national uniformity, consistency, and finality to the meaning and scope of patent claims.” The Court said that experience has confirmed that Cybor is an effective implementation of Markman II, and that the criteria for departure from stare decisis are not met. The Federal Circuit noted that it has long been clear that known interchangeability weighs in favor of finding infringement under the doctrine of equivalents, citing Warner-Jenkinson Co. v. Hilton Davis Chem. Co., 520 U.S. 17, 36 (1997); Graver Tank & Mfg. Co. v. Linde Air Prods. Co., 339 U.S. 605, 609 (1950); Abraxis Bioscience, Inc. v. Mayne Pharma (USA) Inc., 467 F.3d 1370, 1382 (Fed. Cir. 2006); Interactive Pictures Corp. v. Infinite Pictures, Inc., 274 F.3d 1371, 1383 (Fed. Cir. 2001); and Corning Glass Works v. Sumitomo Elec. 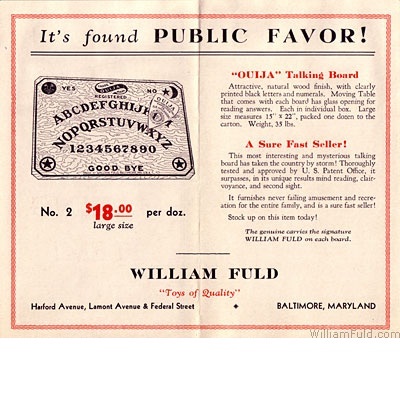 U.S.A., Inc., 868 F.2d 1251, 1261 (Fed. Cir. 1989), and concluding that “[e]xcluding equivalents that were foreseeable at the time of patenting would directly conflict with these holdings that “known interchangeability” supports infringement under the doctrine of equivalents. COMMENT: The defendant may have been confused by the foreseeability test of Festo Corp. v. Skoketsu Kinzoku Kogyo Kabushiki Co., 535 U.S. 722 (2002), which determines the scope of prosecution history estoppel created by a narrowing claim amendment, and thus indirectly the scope of infringing equivlents. Patent prosecutors can breath easier, but should still strive to write claims broad enough to literally cover foreseeable equivalents. February 10, 2014, marked the 123rd anniversay of the issuance of U.S. Patent No. 446,054 on the Ouija Board. As the story is told by descendants of the inventors, the Patent Examiner refused to issue a patent without proof tha the invention worked. 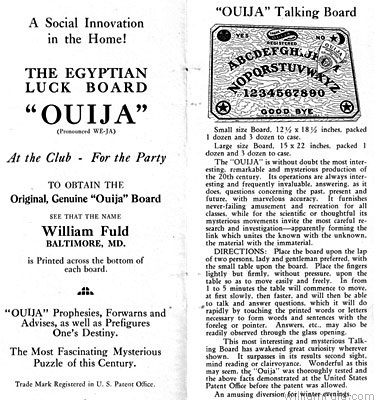 Read more: http://www.smithsonianmag.com/history/the-strange-and-mysterious-history-of-the-ouija-board-5860627/#ixzz2t35YW21m. What actually happened during the interview is a mystery — a problems with many Examiner Interviews today, despite the provisions of 37 CFR 1.133 and MPEP 716. We do know that the patent did issue, and that the patent owners used the issuance as an endorsement of the operability of their invention for many years. But it did not say what he meant. This is reminsecent of Chef America v. Lamb Weston, 358 F.3d 1371 (Fed. Cir. 2004) where the claim “heating to” rather than “heating at” 450° proved fatal to the patent. There were serveral possible fixes, none of which were made. Precisely because there were serveral fixes, Magistrate Thynge found that correction would be subject to reasonable debate, so that Court was unable to correct the error under Novo Indus., L.P. v. Micro Molds Corp., 350 F.3d 1348, 1354 (Fed. Cir. 2003). The Magistrate granted summary judgment that claim 3 of the ‘125 patent is invalid for indefiniteness under 35 U.S.C. 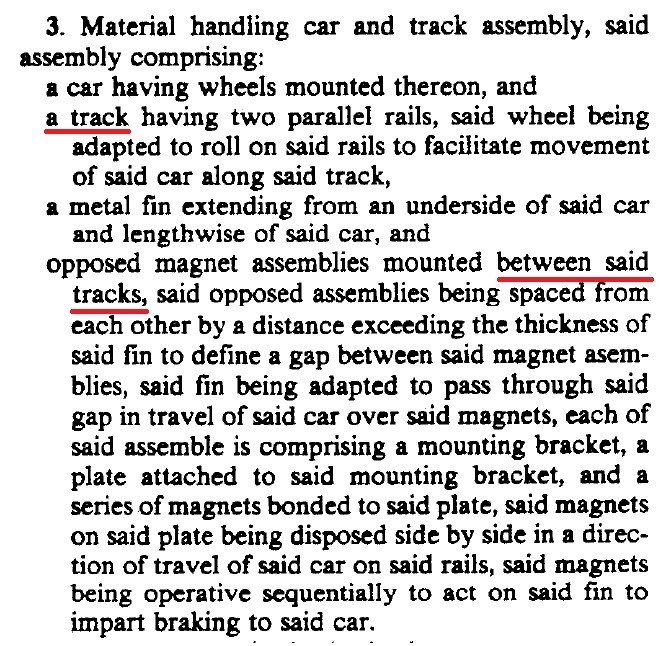 § 112, Paragraph ¶2. Even of the District Court does not adopt this part of the Magistrate’s recommendation, at a minimum the less than precise language of claim 3 wasted time and resources of the patentee. Words of a patent claim are critical, and everyone connected with the patent is responsible for making sure it is correct.